I was looking at the Two Module, 300 to 500 Watt RF Amplifier for 160 and 80 Meters ( http://www.classeradio.com/2module.htm ). I am planning in scraping the parts together for this and the Class H modulator ( http://www.classeradio.com/classh.htm ), and have a few questions. I was planning on doing it with 8 FET's instead of 10. 1) Looking at C13 and C16 in http://www.classeradio.com/class_e_10_fet.jpg. Are these caps of any particular type/spec? 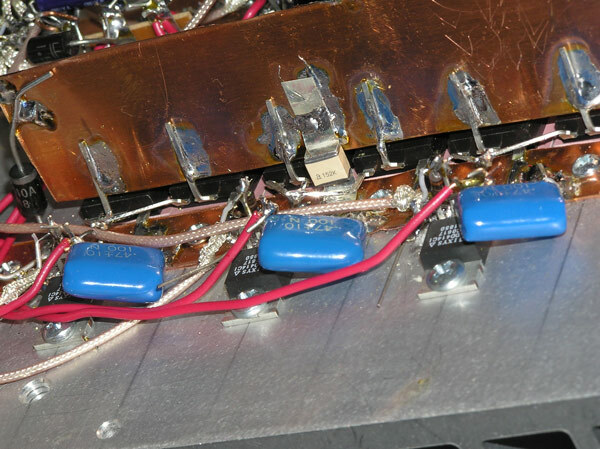 2) Looking at RY2 and RY3 in http://www.classeradio.com/psm_modulator_power_supply.gif. Are the 0.68uF caps of any particular type/spec? 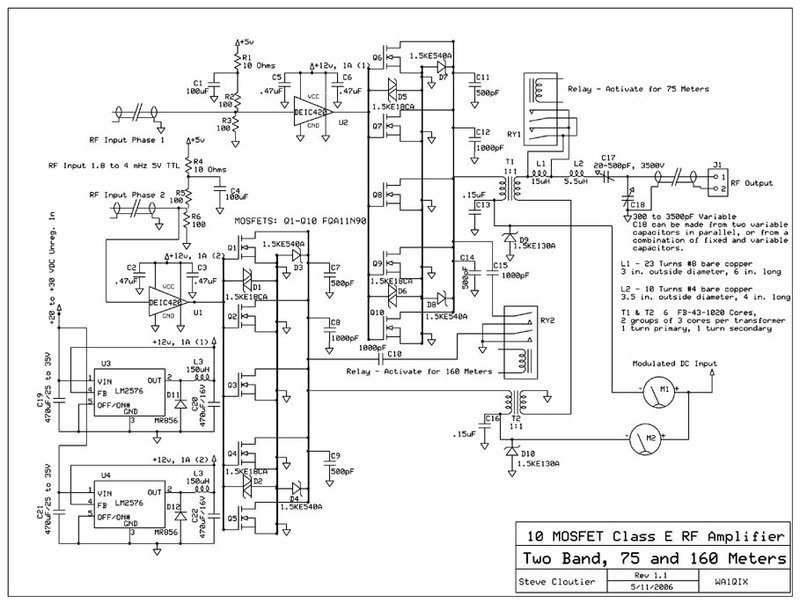 3) Looking at C1 and C2 in http://www.classeradio.com/psm_modulator_power_supply.gif. What is the lowest capacitance value you can get away with for these caps without compromising signal quality? 80,000uF caps are proving a bit hard to find. 4) Are there any concerns with running only 8 FET's instead of 10? I BELIEVE those are what Brent, W1IA used in his transmitter....?? The DEIC420 works well but far more expensive. The new class H modulator has an overload shutdown capability built in (using the overload shutdown/efficiency board), but it is always nice to have the one in the power supply too I actually do use both in my own transmitter, but the one on the overload shutdown board does all the work. The overload board is an absolute necessity when using the new class H design. On devices - the newer class H modulator uses BUF420AW transistors in the output as well as IRFP260n MOSFETs. I would not cut down on the device count unless you are also running lower power. I use 12 devices in my own class H modulator - modulating 9 amperes at 45 volts. Figure about 1.5 amperes per device pair (one BUF420AW and one IRFP260n) and no more. Make sure there is more than sufficient heat sinking, preferably with a small fan. The class H modulator, while more efficient than a class A modulator, still generates quite a bit of heat. The BUF420AWs will not withstand the same heat as the MOSFETs, and require greater cooling. k3tue wrote: I was looking at the Two Module, 300 to 500 Watt RF Amplifier for 160 and 80 Meters ( http://www.classeradio.com/2module.htm ). I'm revamping this design, and will be replacing the schematic. I would suggest going to a design using 12 MOSFETs in the output (6 on each side), and use IXDD414 driver ICs (1 for every 2 MOSFETs). The IXDD414s are much less expensive, and work very well at least up to 80 meters. These should be of very low loss. I use 3 capacitors in parallel - orange drops - 2 .047 and 1 .068 in parallel. They don't get warm! You could probably also use .075s in parallel or something like that. Nothing special - the value is not overly critical either. Just so long as the cap can handle the voltage. As long as it's somewhat close, don't worry about it. If you can only come up with 65000uF, that will be OK or anything between. More is also OK, of course! In the modulator? Yes! In the RF, no. You'll just get less power, and will probably have to drop the shun capacitor values (which I am adjusting anyway, in the new design). How far along are you in revamping the RF amp schematic? Is this going to happen in the next few weeks or months? The reason I ask is I am just starting the process of gathering up the parts, and I am still early enough in the process that I can change direction slightly without a big impact. 1) Drivers: Use the IXDD414 at least up to 80 meters (80 and 160). 2) Number of MOSFETs in the RF amplifier: 6 instead of 5. 3) Values: The shunt capacitors will probably be smaller (lower value). This should always be thought of as variable anyway. 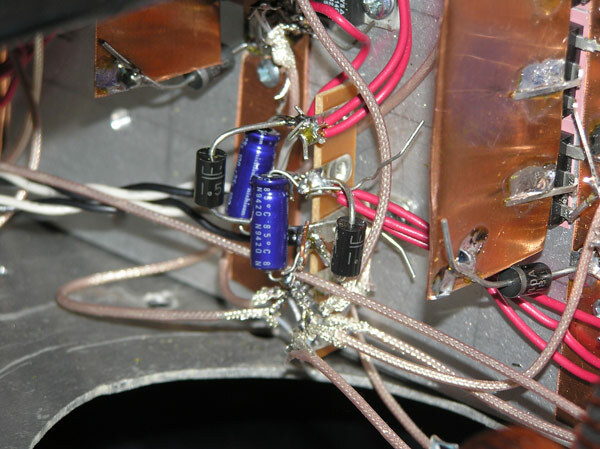 Individual implementations vary, and I've seen examples where the shunt capacitors need to be made smaller or larger in a particular implemetation. 4) VFO: I am looking at some adjustable balancing circuitry, and circuits to control the on-time VS off-time of the output. Too much on time at the MOSFETs will result in lower efficiency. Propagation delays in IXDD414s and other devices result in a gradually increasing on-time, hurting the RF amplifier efficiency. Anyway, that's about it. So, just plan on 6 devices instead of 5 in the RF amplifier and IXDD414s instead of the DEIC driver that's there now. This will cost CONSIDERABLY less money, as the IXDD414s are only a few dollars each (even if 6 are needed) VS over $30 EACH for the DEIC420. Is it save to assume that you increased the MOSFET count in order to maintain balance (2 FQA11N90s per IXDD414) and not because you felt that ten FQA11N90s were being strained at the specified power level of the design? as noted in the first post of this thread seems to be the only way to get to it, and it uses the DEIC 420. So, is there an updated schematic for the revised 160/75 M rig with the 414's or does one just adapt the simple 80 M 400 Watt one, and use the rough values of the output network etc ? OOORR am I just not seeing the button for this rig ? Also, being profoundly lazy, did the Gate Driver board proceed to fabrication ? The one with the DEIC420 drivers was 5 FETs. Use 1500pf of shunt C per module for 75 meters, and about 3000pf for 160meters. It's not an easy thing anyway... because the sources have to get a good low-impedance connection to ground, and the drains need to be good and beefy as well. So you's STILL end up hanging parts in mid air! Meant to add that you'd do the drivers the same way as in the 4 FET per module rig. Except, obviously you have 3 per module. I've been using pre-made switching supplies from Mouser, saves money, and time. Plus you don't need a transformer. Thanks for the replies ..
OK, yea 5, NOT 6 ... may still try 6 FETs per module.. I would have thought that it might be quite a lot easier to get low Z connections/busses and superior P.S. bypassing with a PCB. It would be easier to get cross-sectional area with discrete busses, anyway guess If I think that is true, I should just do it ! I did order some ATC 470 pf 1500 V gull wings, but prob should go with a bit larger value cap. What value ATCs do you recommend for Shunt Cs ? What values do you have (that you are willing to part with )? I was going to ask WHY use the lil switchers for the Dvr 12 P.S.. Is it their peak I capability, or what ? AND, which Mouser switcher are you using ? I do have some DEIC 420's, a neat part, which I might try using, altho, they are a bit more difficult to use in some ways. And double that for 160 meters. For the 6 fet module, you MAY not need 3000pf, 2500pf may be enough. For the most recent 2 modules of 4 FETs I built, 1000pf per module for 75, and 2000pf per for 160 works fine. One of those ATC caps per module is all you need, unless you're multi-band, then you can use a relay to switch in the extra C.
Any switching supply that handles the current (plus some headroom) will work..
A linear supply will work, but the switchers are more efficient, less heat, etc. better peak capability. I used the DEIC 420 for my first rig.. The only "problem" is the clip to hold them securely to the heat-sink. Barring that... it is a little easier to use, since there's only one per module. I have a BUNCH of the 1000pf ATC caps, some 1500, and few 470. In a couple weeks, I'll have a few more 470 and more 1500pf. There is no official schematic for the 6 MOSFET module as of yet. It is very similar to the 4 module design, except that there are 2 more MOSFETs per module, and one more IXDD414. I use one LM2576 based 12 volt power supply for each module's IXDD414 drivers. The only difficulty with 6 MOSFETs, is that most people put the MOSFETs too far apart, and the drain bus starts to get physically long. I have constructed an RF amplifier using 6 MOSFET modules. 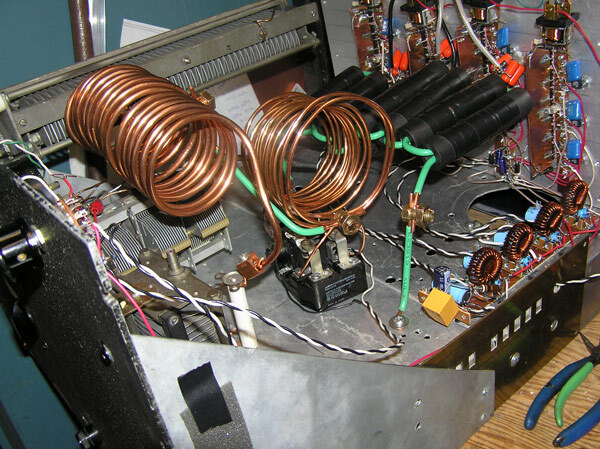 This RF amplifier operates on 160 and 80 meters, and I use relays to switch in additional shunt capacitance for 160, and short out the 160 meter tank coil when on 75 meters. The drain busses are fairly wide (about 1.5 inches), and the MOSFETs are as close together as I could put them (about 1/4 inch between). *EACH* IXDD414 driver has its OWN thin 50 ohm coax connecting the driver input to a common point. Each piece of coax cable is the same length; about 6 inches long. There is a 300 ohm terminating resistor at each IXDD414, and there are 6 IXDD414s per phase (3 IXDD414s in 2 modules). The combination of 6 300 ohm terminated connections in parallel yields 50 ohms. I am not concerned about the SWR on a 6 inch piece of 50 ohm coax, terminated in 300 ohms. The important thing here is the combination of all of the 300 ohm terminations in parallel (which is 50 ohms) - and this common point is fed with a long piece of cable, connecting to the VFO. Here are some pics of the completed transmitter, and closeups of the modules. Below: one module. Note how fat the drain bus is. The MOSFETs are also very close together. Each IXDD414 has its own thin coax, with a terminating resistor. Here is a closeup of one of the relays used to switch in an additional 1500pF of shunt capacitance for 160 meters (one for each module). Note the relays are soldered DIRECTLY to the source bus (ground), and the shunt capacitor is soldered directly to the relay, eliminating wires. These are Radio Shack 30A automotive relays (12V coil). 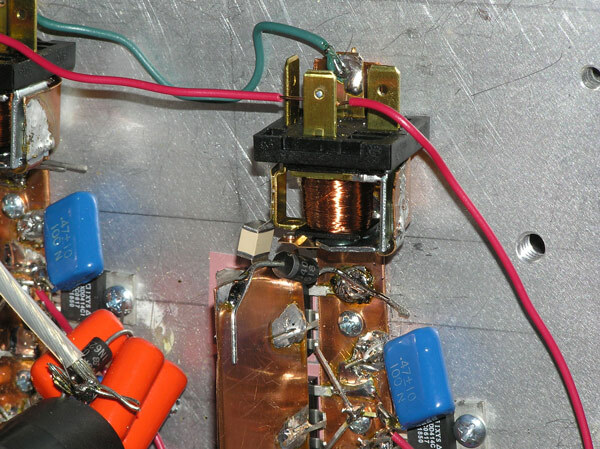 Here is the overall RF amplifier showing the large relay used to short out the 160 meter coil when operating on 75 meters. The 4 12V power supplies for the IXDD414 drivers (one for each module) are to the right. The 75 meter coil is made with number 4 wire (the entire coil is not used - a tap is visible about 1/2 way down the coil).